INTRODUCTION: We are a training institute under the name “Previse Security Training Institute” for training of private security guards which is the first institute recognised under the Private Security Agency (Regulations) Act 2005, (PSARA) by the Controlling Authority, Home Department, Govt. of NCT of Delhi. We are located at Village Mandi in a campus of 5 acres lush green area, about 7 Kms. From Chhatterpur Metro Station/ Andheria Mor, in Mehrauli area. 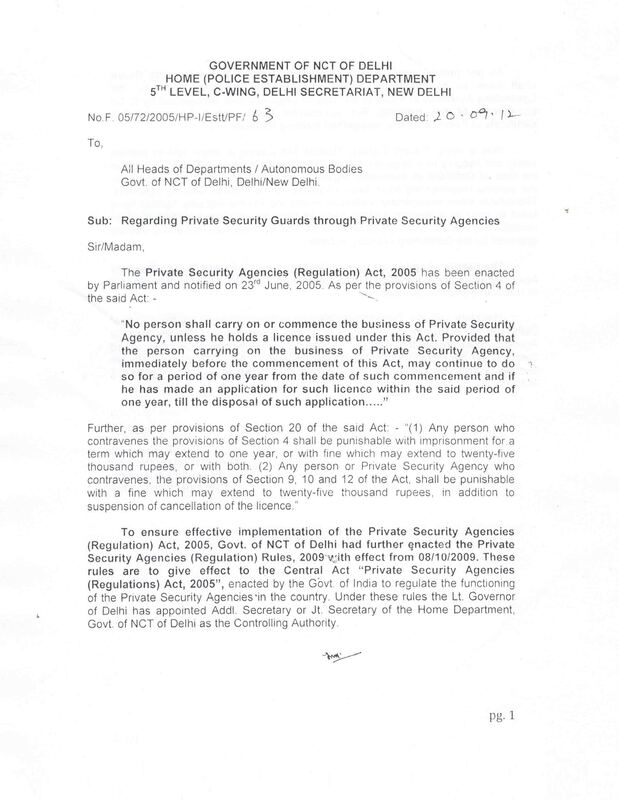 MANDATORY REQUIREMENT OF TRAINING UNDER PSARA: I am sure, you are very much aware, under Sec.9 & 10 of the PSAR Act 2005 and Rule 6 of the Delhi PSAR Rules 2009, it is mandatory for the Private Security Agencies to deploy only those security gurads/personnel who have been trained from an institute that has been recognised by the Controlling Authority, Govt. of Delhi, under PSARA. You must also be aware that violation of these mandatory requirement is punishable under Sec.20 of the PSAR Act 2005. ADVANTAGE OF TRAINING IN SECURITY BUISNESS: You will agree that in order to increase your presence in the market you have to be complient with the legal provisions and as such proper training of your security guards as required under law is a must. You also avoid risk of prosecution under law. If your guards are properly trained you are less likely to have any trouble in your operations and you can conduct your buisness without any hassles or fear of losses. It is good for both the principal employer as well as the security agency. Money spent on training is good investment. You can also claim better rates for well trained security personnel and share the profits with your men. That will make the buisness more enjoyable, for both you and your men. 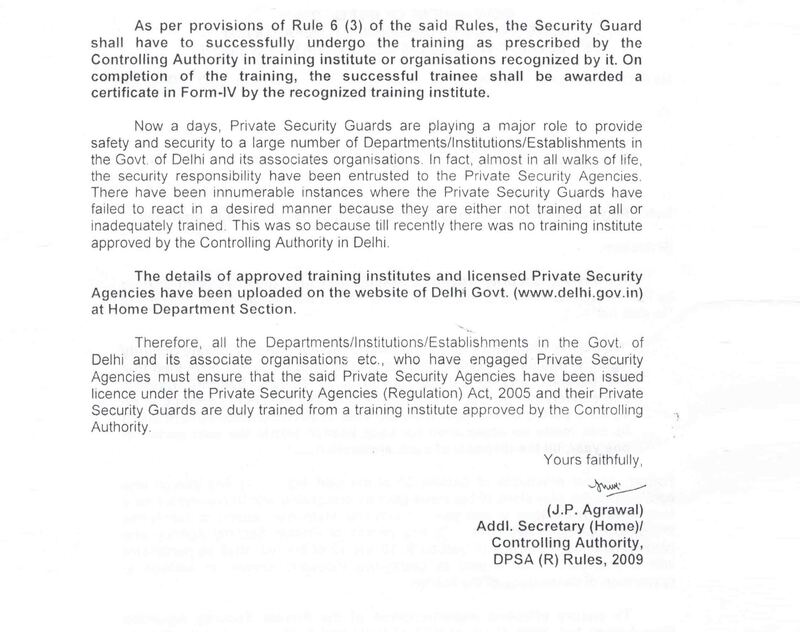 FAKE TRAINING CERTIFICATES: Some agencies out of ignorance are taking a short cut route by procuring fake training certificates for its security guards- without actually undergoing training. In fact they are putting their Directors/ Proprietors under risk of prosecution under Sec. 467/468/471/120B of IPC carefully which describes the punishment for procuring and using fake documents and this offence is non-bailable. It is strongly advised not to venture for a small gain at such a high risk. Both, the erring Security Agency and the Training Institutes, run the risk of prosecution any time; may be in one year or even in ten years from now. The authorities concerned are very much seized of the matter and are up to take action. SUGGESTIONS: We start a course for security guards on every 1st and 15th of each month. You can send any number of guards, even 5, for training regularly every fortnight instead of sending large numbers in one go. This will be not much burdensome and will be operationally manageable, especially for smaller agencies. Slowly, you will be able to have a sizable number of guards that are trained and you can move forward in the business. TRAINING CHARGES: ₹3000 per person is the fee. If you enrole 10 or more security guards for training, we shall provide free transport from Chhatterpur Metro station to and from our institute. We also provide, on demand, working lunch and necessary stationary to the trainees, during training, for an additional amount of Rs.1000. (We recommend it because a hungry trainee learns nothing. Also it will be a good incentive for the trainees). HOW TO ENROLE FOR TRAINING: Just ring up Mob Nos.9971476899 or 9818099033 or SMS “need enrolment for training” or write an E.mail to previse@live.com and our representative shall get in touch with you and help you complete all the formalities.